I've been thinking about the idea of weird geology, ever since Dana at En Tequila Es Verdad introduced the topic for Accretionary Wedge #34 — I haven't been thinking about it long and hard, mind you, because I've been busy writing geo things at work, using up both my writing and thinking capabilitites. I wrote a little, thought a bit; then, after thinking some more, I thought I’d finish up this morning at the laundromat, but it tuns out they don’t have wi-fi, which is one thing I find not only entirely weird, but just a little bit irritating. I have a few thoughts about geological weirdness, the biggest of which is that after all these many years (however long it’s been), I am no longer as surprised by the things rocks can do as when I was first starting to map as part of my job back in the late 1970’s. Back then, I learned an important lesson that has stuck with me over the years, which is: if the rocks are doing something you don’t think is possible or which you have never heard of or read about, look again. Have another geologist come check out your contacts and the nature of whatever weirdness you think you spotted, and brainstorm some ideas. Chances are, you have run across something merely unusual but not impossible. You will have to go with whatever the rocks are telling you that they did on their way to becoming whatever thing they are now. Volcanic rocks, inside or outside the Huge Caldera settings sometimes known as "Supervolcanoes," can do some particularly unexpected things. When anywhere near them, learn to expect the unexpected and to throw out preconceived notions as soon as it becomes clear that you need to (which isn’t all the time, admittedly). Apply this way of thinking to other, non-volcanic settings. Over the years, expecting the unexpected will serve you well. Other places to expect particular geologic weirdness are 1) anywhere in the Basin and Range province and 2) any time you are anywhere near a metamorphic core complex or where you suspect that you are in detachment or extreme extension terrane. I’ve found tilted Precambrian rocks above a 50-foot thick, crumbly, weakly mineralized mesobreccia of gneissic rocks, all sitting on top of tilted Tertiary sediments that included soft, punky lake beds. Possibly this unusual tectonic stratigraphy of very-much-older over very-much-younger was not produced by extreme extension, possibly the Precambrian was thrust over the middle to late Tertiary via a thrusting method related to left-lateral strike-slip faulting along the Garlock Fault. Who knows? 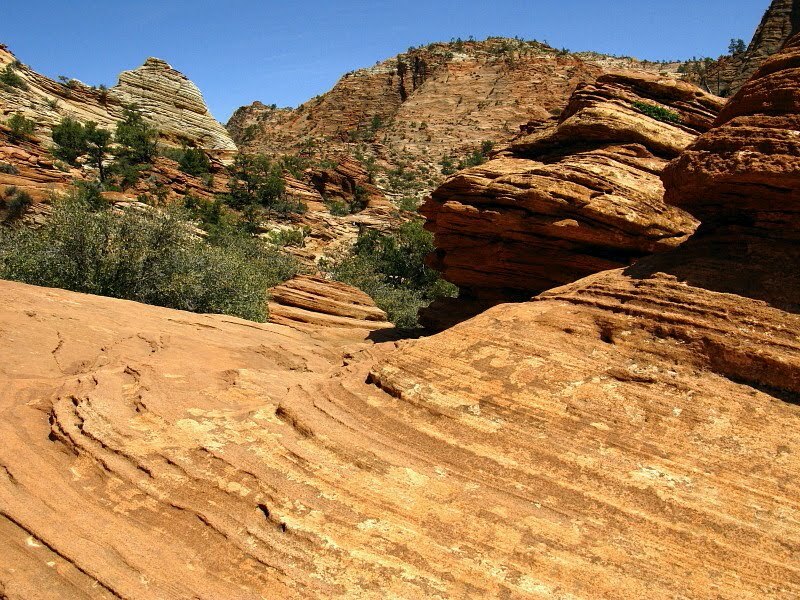 We never drilled deep enough to find out what lay beneath the tilted Tertiary rocks beneath the tilted Precambrian rocks. As for weird today, I'll just leave you with these pictures of a giant breccia (breccia in the foreground, breccia in the background). We were driving into the slot-canyon portion of Titus Canyon, a one-way dirt route into Death Valley from just south of Beatty. We drove around a curve in the road, suddenly coming face to face with a megabreccia. I slammed on the brakes (not that I was driving very fast to begin with). 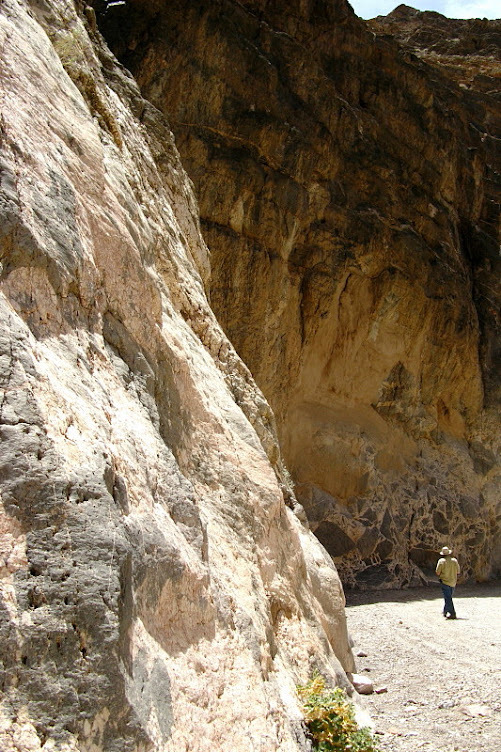 The same angular rock fragments from the first photo can be seen in this second photo, this time without anyone for scale. The breccia extends at least 35 to 40 feet up the wall. 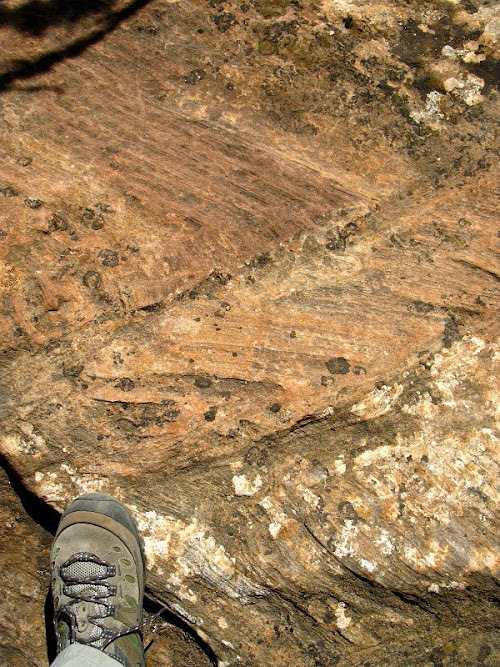 In reading up on this breccia, I found more than one explanation, including more than one kind of sedimentary origin to vaguely cited tectonic causes. Anyone have any ideas? For a picture with better scale, go here. Too bad I didn’t get a picture of myself standing in front of this magnificent megabreccia! 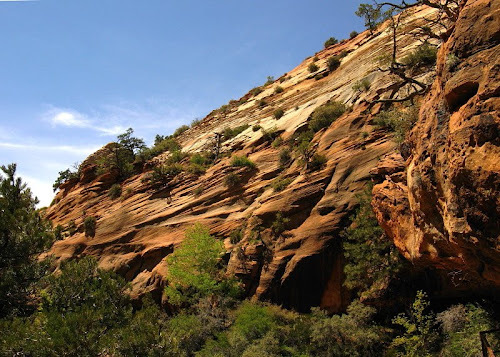 UPDATE: Accretionary Wedge #34: Weird Geology is now up at En Tequila Es Verdad. We've been very busy this month, and the month before, as you might be able to guess from the lack of posting on this blog -- but we have managed to get a bit of our garden going in the backyard of our little house, just like we did last year, though not on such a grand scale. 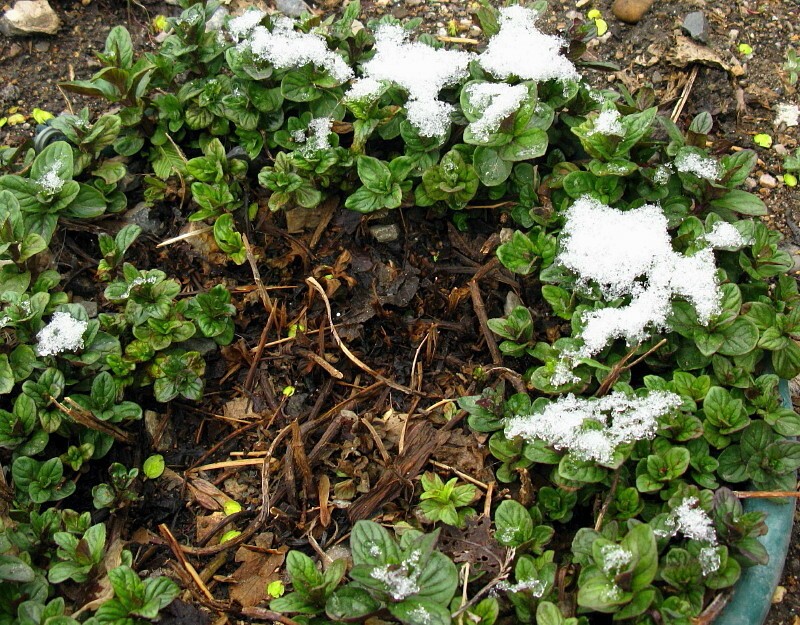 The chocolate mints, which were in the ground all winter in pots, so as to prevent too much die back, are going quite well, and were yesterday pulled out of the ground. These pictures, from May 16th, show them with a sparkle of snow. We have fewer plants from seedlings grown indoors this year (so far), and most will be in the ground by the end of today [written yesterday, see update below]. 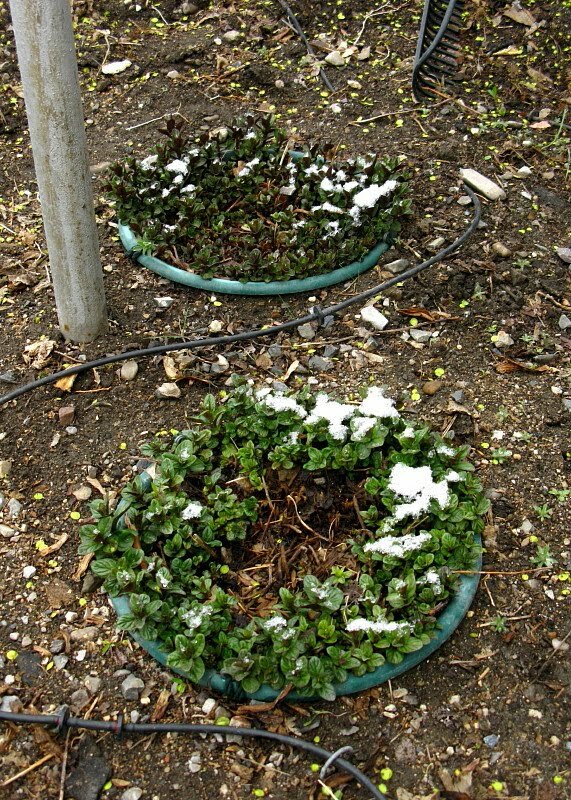 Hopefully it isn't too early for them, but we need to get them on the drip line, so in the ground they go. We'll be planting flower seeds around our seedlings, maybe right where these mints are sitting now, and also in the front garden and in a little patch along the edge of the street, where I'm hoping the overly easy to grow Cosmos and cornflowers will flourish. Update just prior to posting: One squash and two tomato seedlings are in the ground; the rest are waiting for a less rainy day. It poured and hailed and lightninged and thundered and rained ... and our garden became a little too damp for planting (ha! -- drenched is more like it). And we're getting another deluge right now! Here they are! I finally have these photos of Bighorn sheep uploaded, now that Blogger is back up and running (three or four of my original uploads lost from this post while it was in draft mode during the process of Blogger fixification, but which were fortunately saved on another blog that I use for editing purposes). 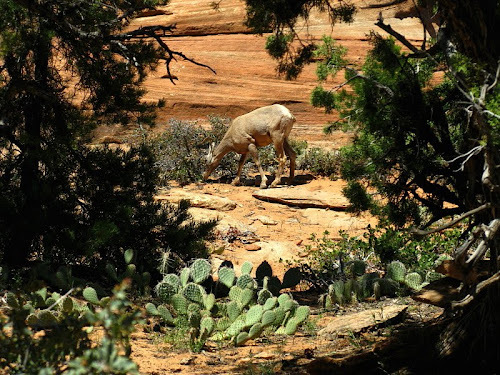 From the grouping in the first photo, we know that there were at least 7 or 8 critters munching bushes not far off the Canyon Overlook Trail (in Zion National Park, first seen here and here) -- at least three lambs and at least three ewes -- and there were more: one or two more lambs and at least two more ewes wandering around closer to us amongst all the sandstone beds and little cliffs, making at least 10 or 11, depending on how many I'm actually seeing in the first photo. A ewe framed by trees and prickly pears. At least two ewes and one lamb wandered through this framing area, with me walking slowly closer and closer, not wanting to scare them away, not knowing that they were quite adapted to people. One of the close-by lambs, not far from the previous shot. 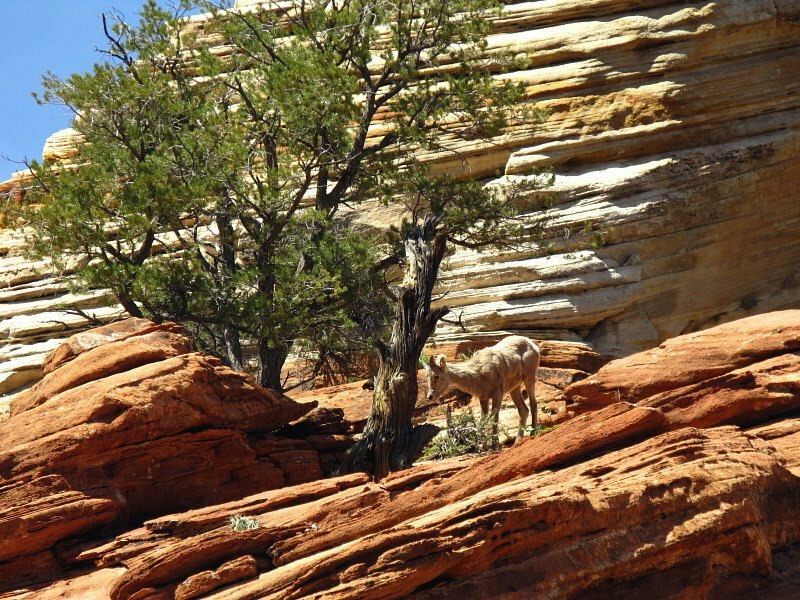 This same lamb, or a second close-by lamb, was seen in Cross-Bedded, high above us on sandstone ledges. 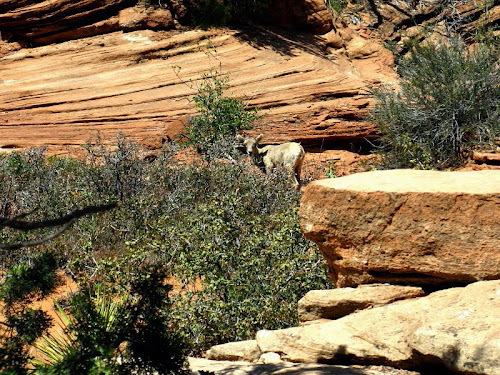 As we walked back from the Zion Canyon overlook at the end of the trail, we eventually came upon these two ewes hanging out on sandstone strata about 20 to 40 feet above the trail. 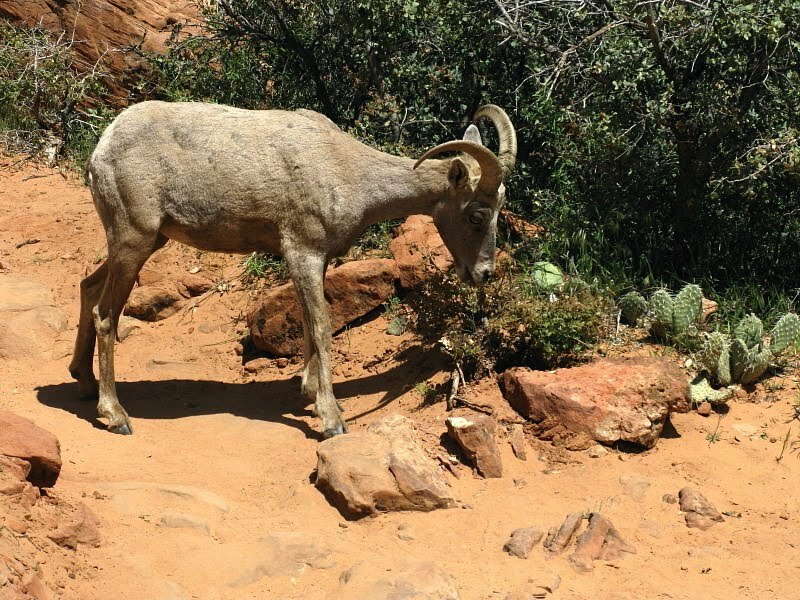 They posed for quite some time, and other trail hikers stopped to look and snap photos. Suddenly, around the corner behind the first ledge, we came upon two ewes munching bushes right on the side of the trail. In fact, one was in the trail to begin with, then moved behind a tree as we snuck closer. 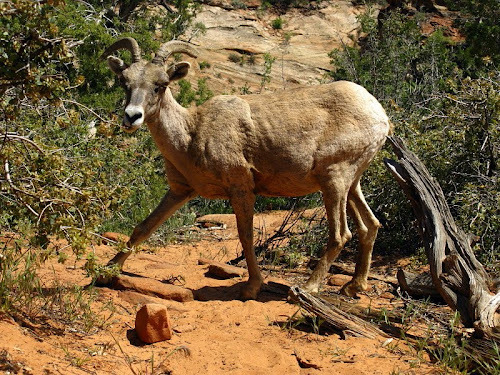 The in-the-trail ewe was first seen in More Cross Bedding, where she provided a rough scale to an nicely cross-bedded exposure. It turned out that we could get quite close, within twenty feet I'd say, without scaring them off. 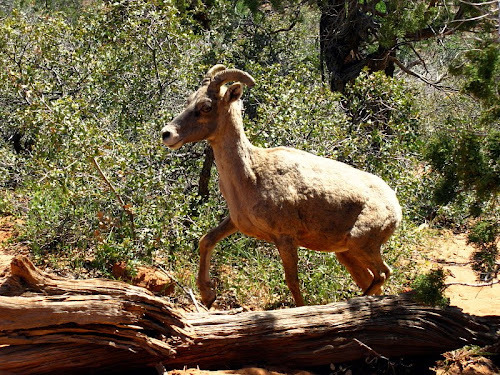 This first one did move from behind a tree to a slightly farther bush, but then let us move closer. Here she's settled in to bush chomping, but is keeping an eye on us. 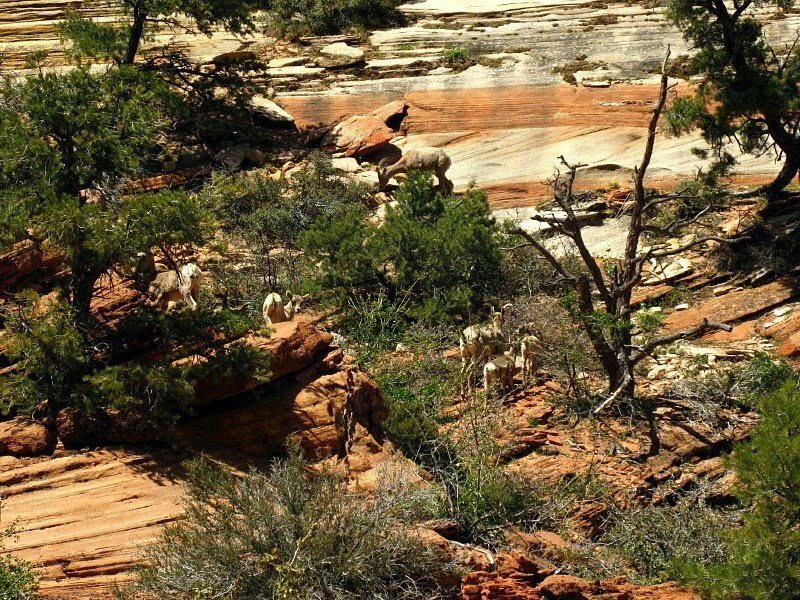 The other trail hikers were still back at the first ledge, looking at the two ewes above, and hadn't caught up with us, so we had them all to ourselves for a bit. The second ewe in the bushes didn't seem at all disturbed by us, but she was a little farther away and sometimes behind the other one. We had to walk by them, there was no other place to walk, so eventually, after only a couple minutes, we did -- we still had miles to go by road, and were about 15 minutes, walking quickly, from the Prius. 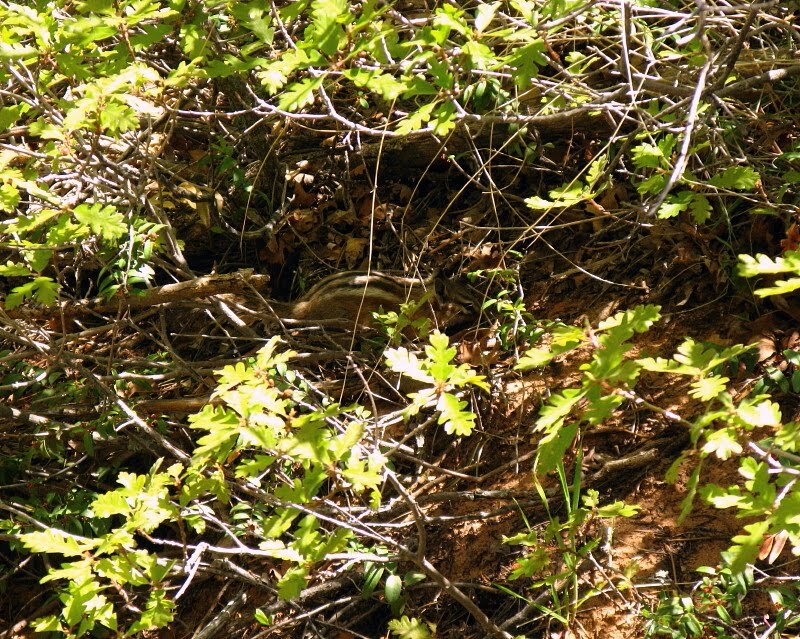 Earlier in the day, we spotted this chipmunk underneath some low-growing oak shrubs. We heard birds, but didn't spot them quickly enough for photos. 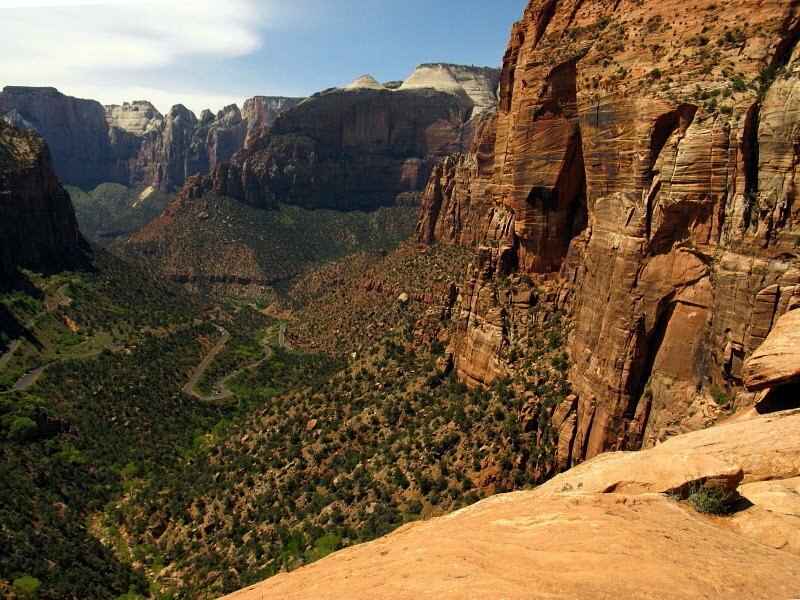 There we were, at the end of the Canyon Overlook Trail in Zion National Park, looking west toward the southern end of Zion Canyon, where the North Fork of the Virgin River flows through (not that you will see it the Virgin in this post). Reddish brown to orange cross beds of the Jurassic Navajo Sandstone (Jn) were everywhere, available for angled sun bathing, photography, and a bit of careful climbing. And beyond and above, there is the ever-present white (and still cross-bedded) upper portion of the Navajo. 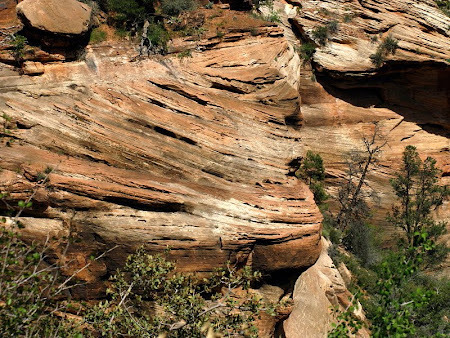 I zoomed in on a fascinating section of white to yellowish sandstone in the cliff below the upper white sandstone: cross beds amongst cross beds. A small tree, and a mini-tree below it, grow near the edge of the 400-foot drop into the lower canyon of Pine Creek. Wedge and trough cross strata can be seen in the nearby reddish cliff behind the tree. In the distance, an inset arch may eventually form beneath the uppermost reddish layer, below the upper white sandstone. I looked over the edge at the actual trail end, which has a convenient metal railing. 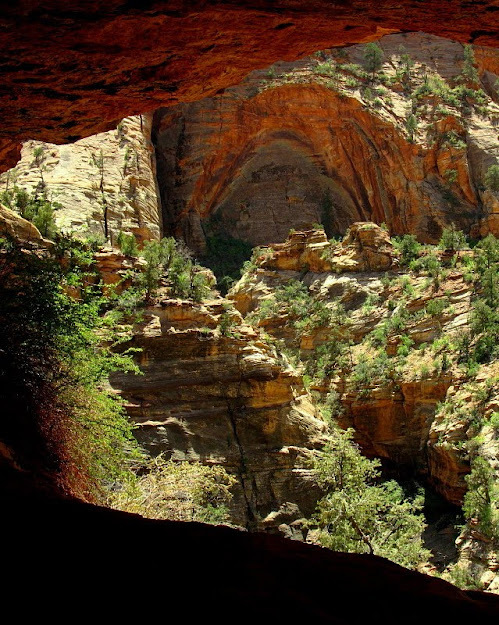 One of the windows for the mile-long tunnel on the Zion – Mount Carmel Highway (Utah S.R. 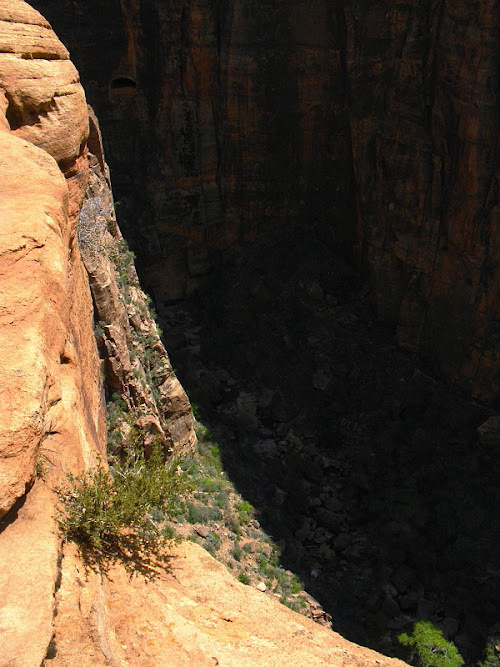 9) can barely be seen in the deep shadow to the right of the sunlit cliff. If we could hang way over the edge, we'd see The Great Arch, an inset arch just beneath us. I took the photo from one of S.R. 9's many switchbacks (six, to be exact) as it makes it's way up to the west tunnel entrance. 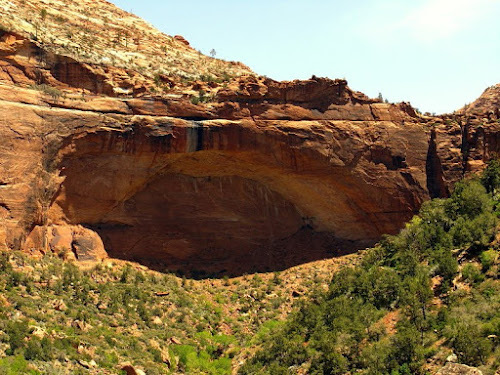 This kind of inset arch is sometimes called a blind arch. 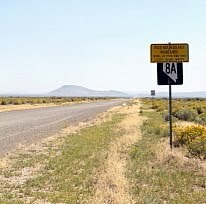 Finally, we have to turn away from the overlook to head back towards the trailhead and the road east. 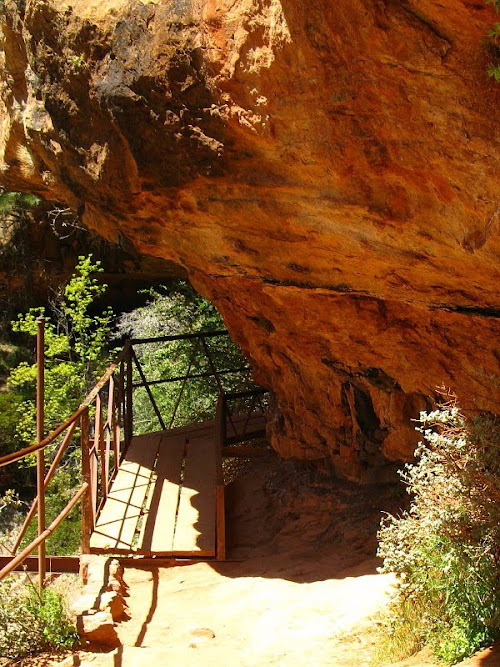 A narrow part of the trail, with a small dropoff, heads back toward the cave seen in the last post. 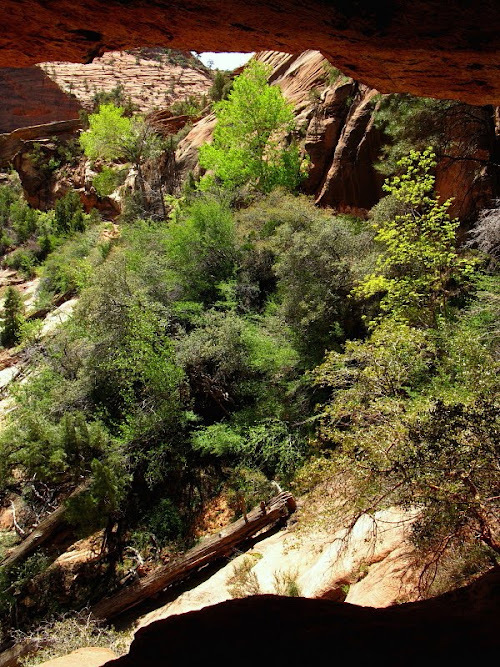 The inset arch visible from the cave, across the slot-canyon portion of Pine Creek, can be seen in the shaded background of this photo. 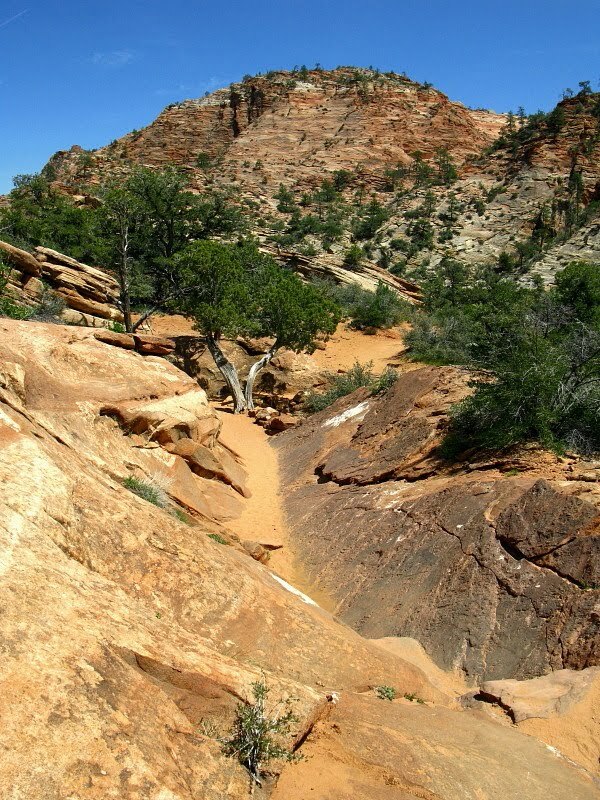 Around the corner, the trail goes into a sandy narrows between pale orange sandstone and a reddish brown layer. 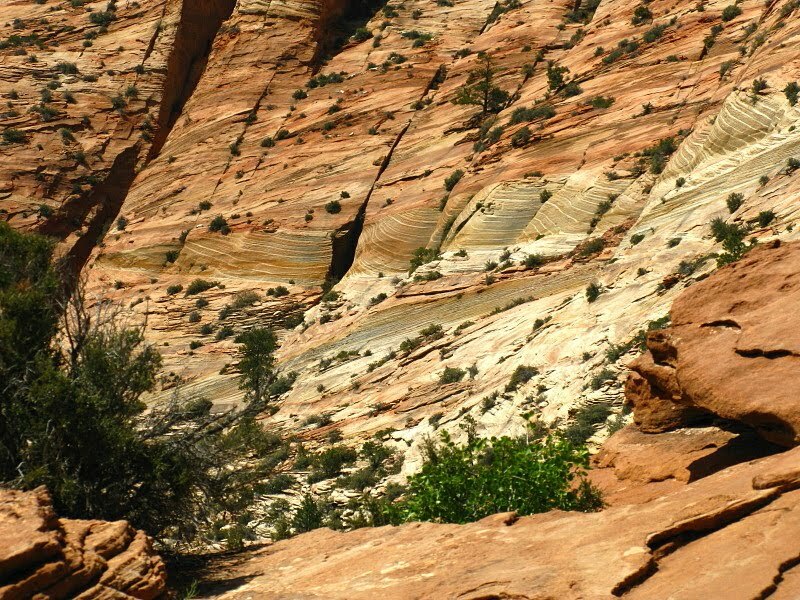 The cross beds here (and in much of Zion) are generally dipping to the south, as can be seen in the far cliffs, indicating that the wind blowing the dune sand came from the north. Here, the the pale orange beds we've been walking on are dipping to the south, and the reddish brown layer we're about to walk on dips to the north. 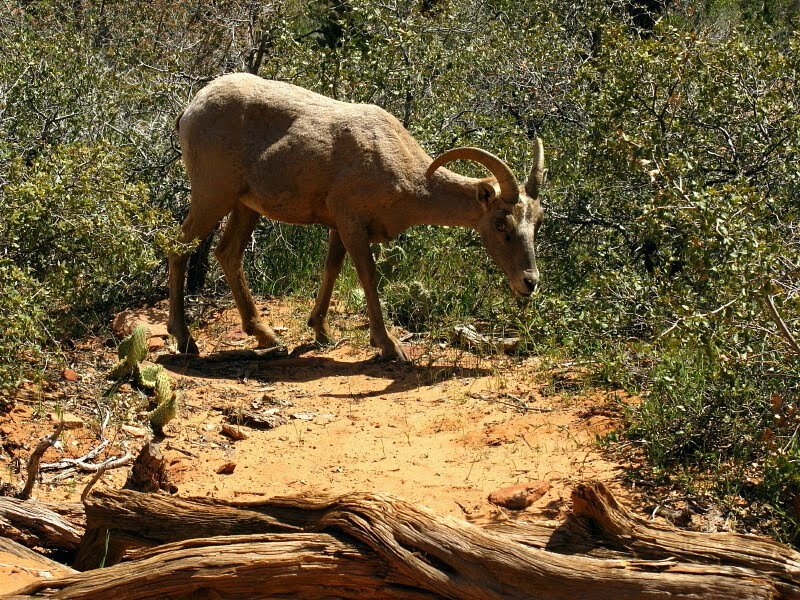 On the way back, the Bighorn Sheep we passed on our way out had moved closer to the trail (right on the trail!) and closer to the trailhead. This one was munching on bushes near this magnificent exposuring of cross bedding. I'll show more pictures of these critters in another post. Even more cross bedding, with some tafoni-like weathering accentuating some of the layers. 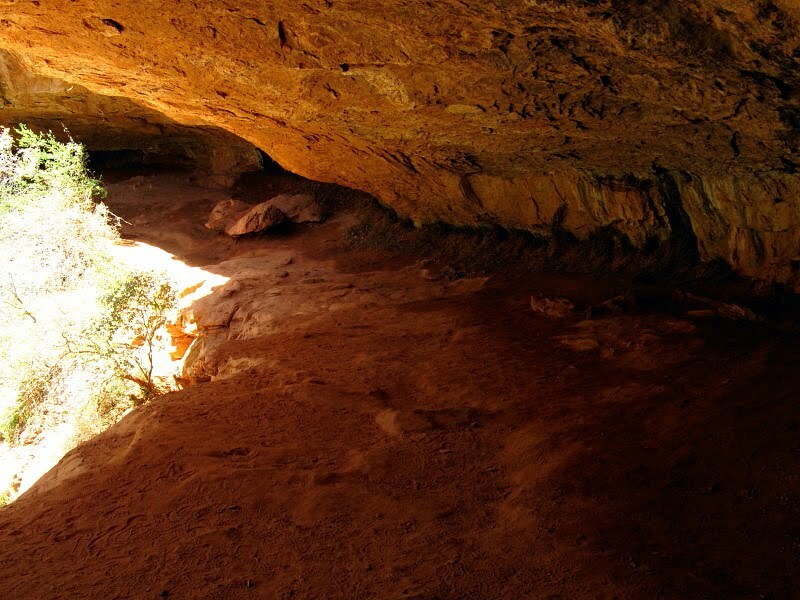 We're now in the home stretch on our way to the parking area, having passed the overhung cave. 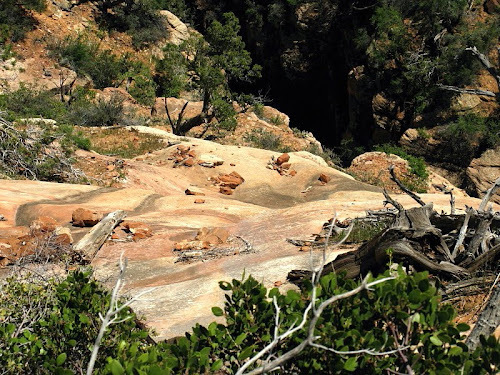 This is one of the heavily hand-railed sections of the trail: there's a ledge about 5 feet below the trail, then a couple-hudred-foot drop to the slotted canyon of Pine Creek below. 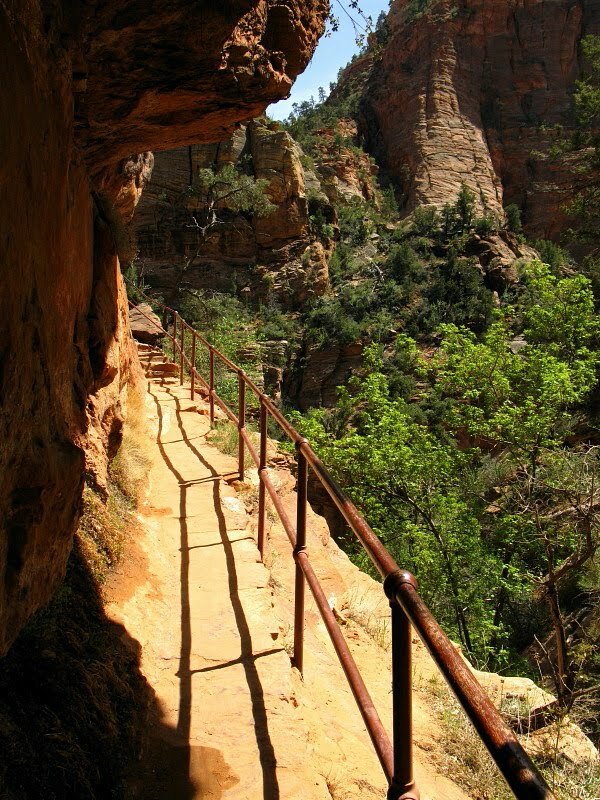 Ahead, the trail goes around a corner to turn more easterly, goes past the leaning tree of the first post, and then goes into relatively steep, somewhat slippery, sand-covered sandstone ledges and the doubly railed steep stairs carved in sandstone at the beginning of the trail. I strongly recommend going out of your way to take this hike. 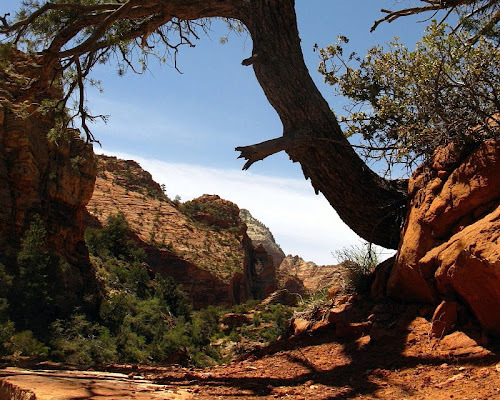 This mini-series will now go in at least two directions, one being the road from St. George, Utah, to Zion, through the tunnel and over the pass to Mount Carmel Junction, with a couple photos on the loop road toward Cedar Breaks and into Cedar City. There will be no pictures from Cedar Breaks: the highway department hadn't even considered plowing snow from the south entrance, where it was at least two feet deep. Cross-bedded Navajo Sandstone near the Canyon Overlook Trailhead in Zion National Park. 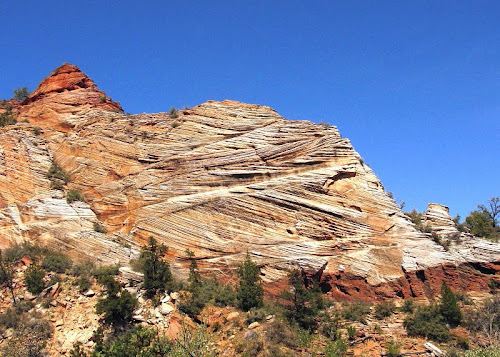 I didn't know we were going in search of cross bedding the day we decided to circumvent downtown Zion Canyon (a place you can get to via shuttle, a Red Pass, by bicycle, or on foot), to take the side road under and over the mountain: the Zion–Mount Carmel Highway. I remembered from long ago, and indeed the Zion Canyon Map confirmed, that an overlook trail takes off back towards the canyon just past the main tunnel, a tunnel that is 1.1 miles long and was built in 1930 (Google Maps Street View of the tunnel near the first window). 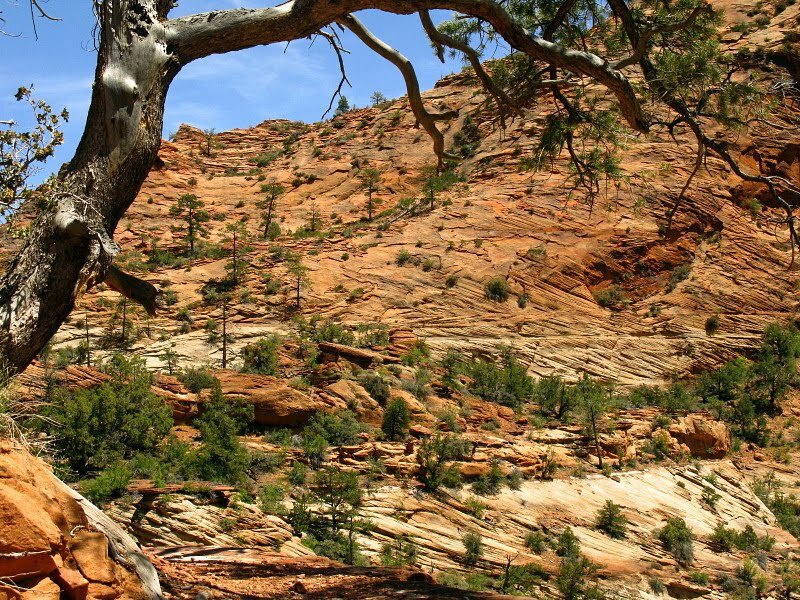 I had very little memory of the trail, other than that it provided an overlook of the lower part of Zion Canyon. The trail is entirely in (or on) the Jurassic Navajo Sandstone, a thick dune sand recognizable in cliffs from miles away. 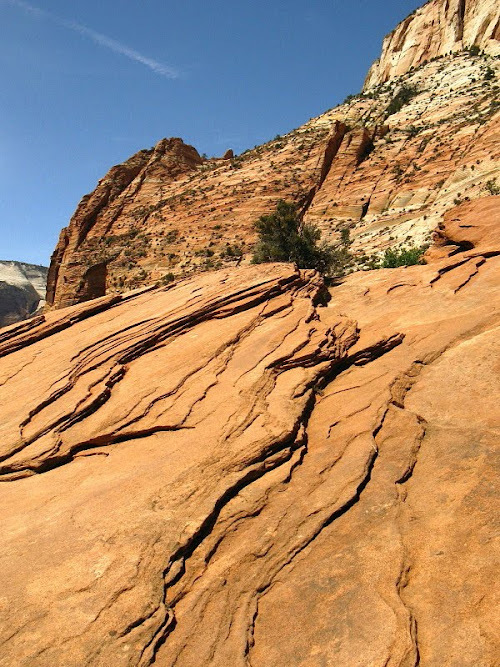 I smiled the entire length of the trail and back: I think it was the cross-bedding. The hike may have stirred some sentimental sentiments (about these cross-bedded sediments), but if so, the stirred memories are buried too deep to make a difference to me today. 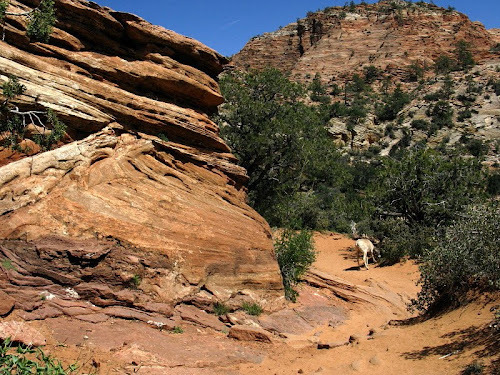 The trail is a 1 mile round trip with a total change in elevation of 163 feet. 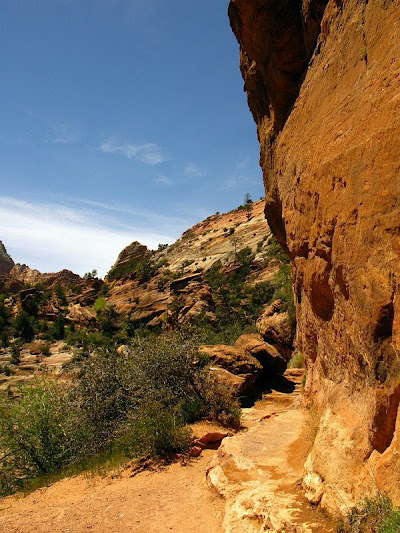 It's rated as moderate, mostly because of some narrow passageways and long drop-offs. 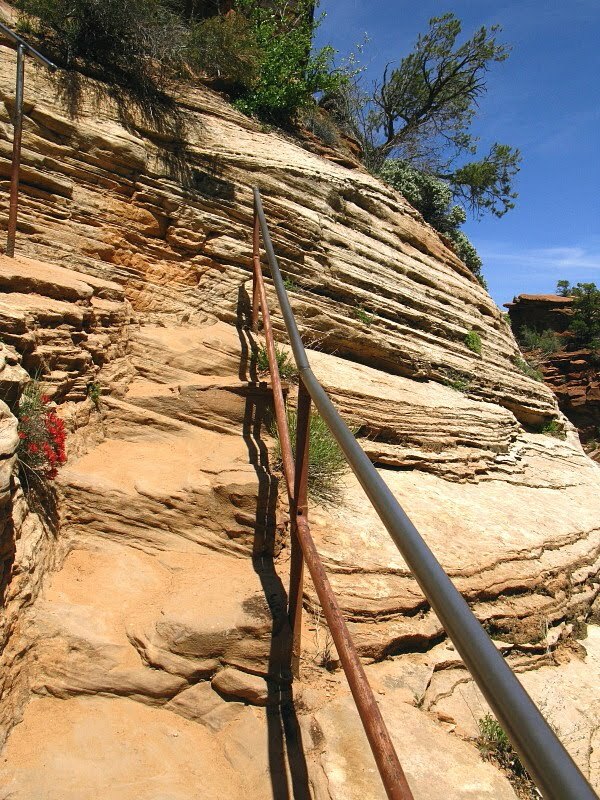 Handrails are provided in particularly steep parts and where drop-offs are particularly dangerous or where the trail is narrow or slippery. 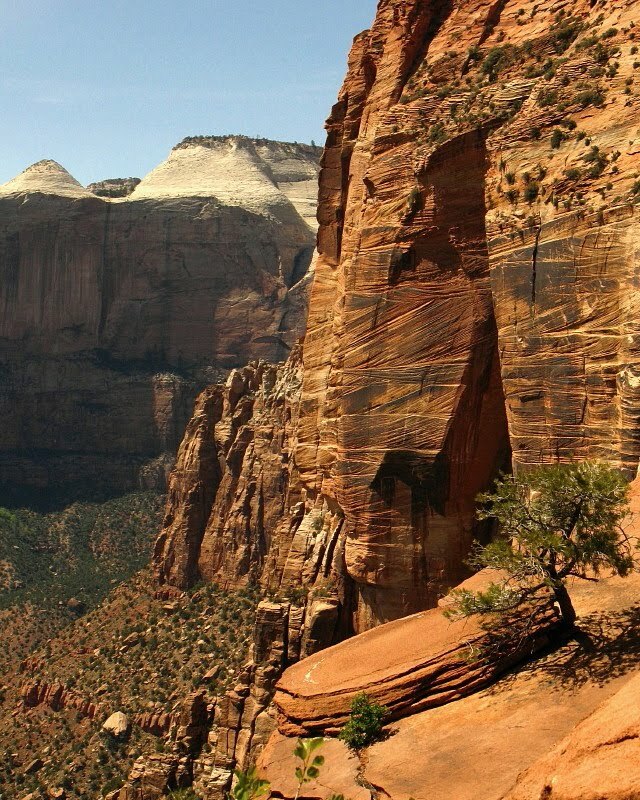 At least one person has died after falling 400 feet from the end-of-trail overlook. The trail begins in a set of steep stairs carved into a pale orange part of the Navajo. Views are everywhere stunning. A leaning tree frames the fore trail. 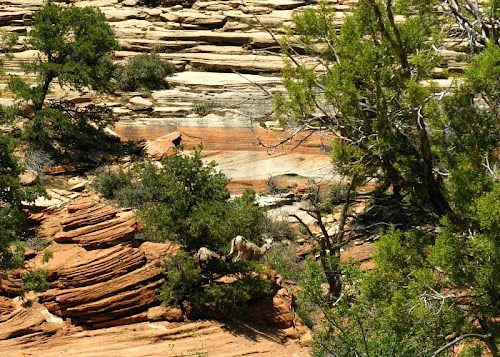 Looking back under the leaning tree provides a view of the ever-present cross bedding. A somewhat narrow part of the trail has a small seep near the base of a sandstone cliff. 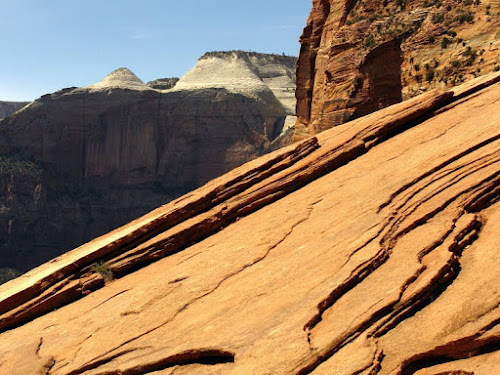 Cross bedding! 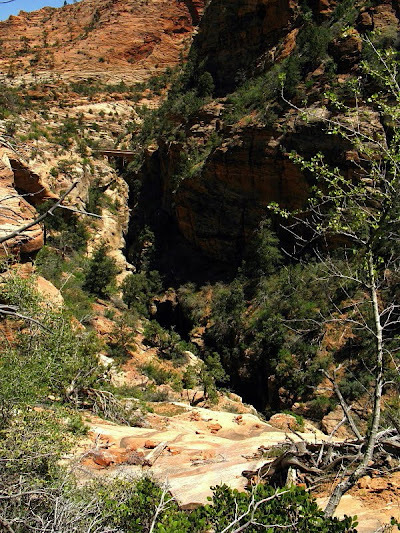 The trail, hidden by trees at the base of the cliff, goes on beyond a little embayment in the canyon. More cross bedding, a little below the previous shot. 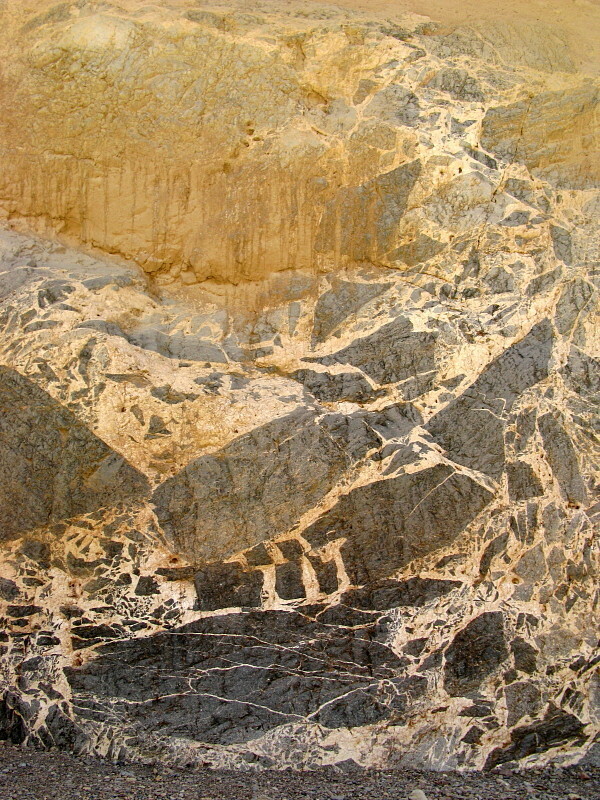 Rocks are perched in a manganese-stained gully. The trail — becoming a boardwalk hung over a hundred to two hundred feet of air — is about to enter a small alcove or cave. Water seeps all along the base of the overhang, drips down the back wall, and drips from the ceiling. The air was already cool before we entered the cave, possibly not quite 70° F; inside the cave it was cooler and damper, probably a great place to hang out in the heat of summer. For scale, you can see footprints in the foreground on the sandy floor; the height near the farthest shade-sun boundary (with tree to the left and rocks to the right) is about 12 feet. An inset arch can be seen from the cave, across a slot-canyon portion of Pine Creek. The trail is still hidden by trees. 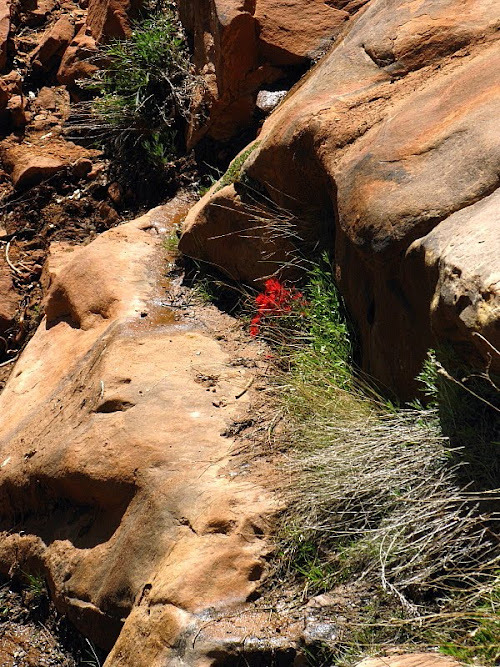 Now we're walking along a narrow ledge cut in sandstone, just above this Indian paintbrush. Looking back toward the trailhead and the bridge coming out of the mile-long tunnel, we can see the slot-canyon portion of Pine Creek. MOH said he could see the bottom of the canyon with binocs. 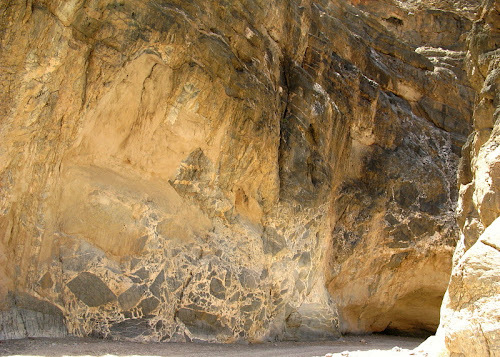 The rocks on the bare sandstone in the lower part of this photo are the same rocks perched on cross beds from six shots back (second of two cross bedding photos before the cave). The rocks will someday plunge into the slot canyon below. While taking a little side trail, we came upon a small herd of six to ten Bighorn Sheep, ewes with at least two lambs. 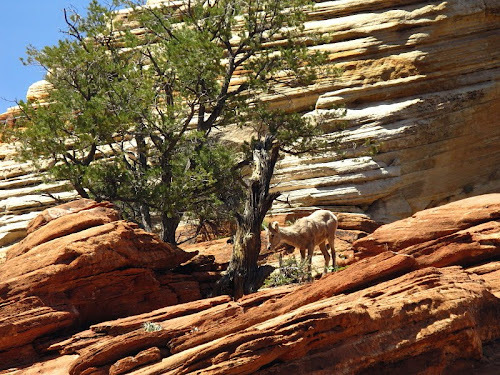 A lamb amongst the cross beds. 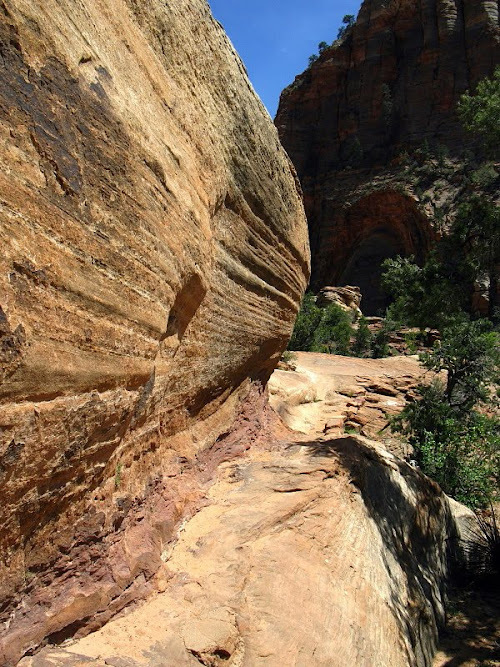 After a little less than an hour of moseying along, we arrived at our destination, the canyon overlook above The Great Arch (MSRMaps location, Google Maps photo). The entire geoblogosphere has been tagged! Loope, D.B., and C.M. 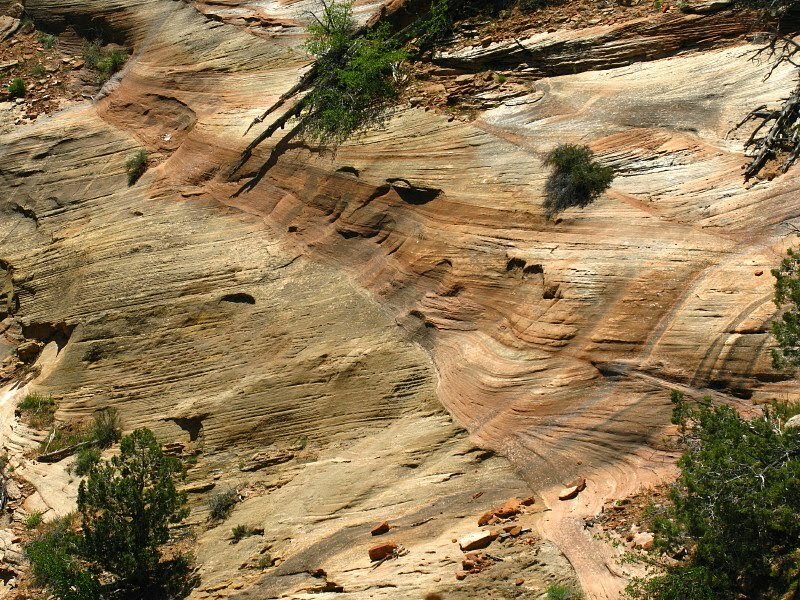 Rowe, 2005, Seasonal Patterns of wind and rain recorded by the Navajo Sandstone: Canyon Legacy, vol. 54, p. 8-12. Loope, D., L. Eisenberg, and E. Waiss, 2004, Navajo sand sea of near-equatorial Pangea: Tropical westerlies, slumps, and giant stromatolites, in E.P. Nelson and E.A. 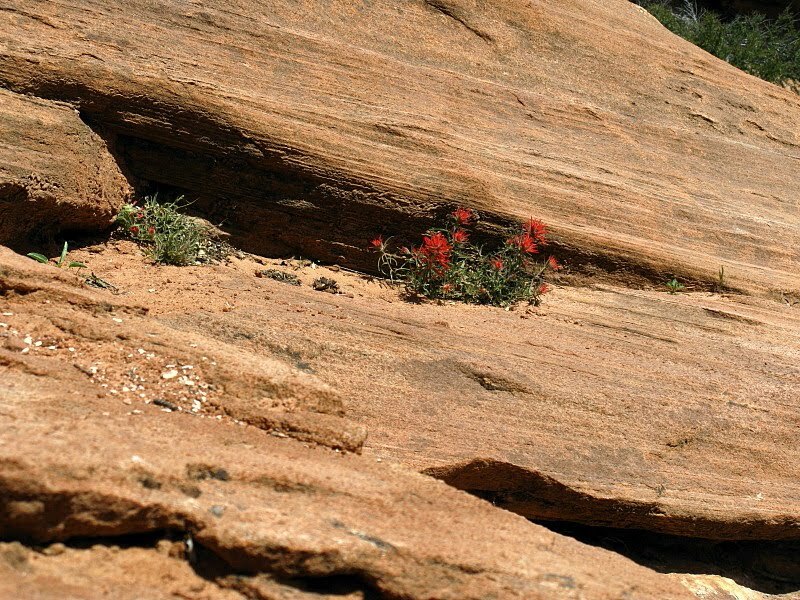 Erslev, eds., Field Trips in the Southern Rocky Mountains, USA: Geological Society of America Field Guide 5, p. 1-13. Loope, D.B., M.B. Steiner, C.M. Rowe, and N. Lancaster, 2004, Tropical westerlies over Pangean sand seas: Sedimentology, vol. 51, p. 315-322. 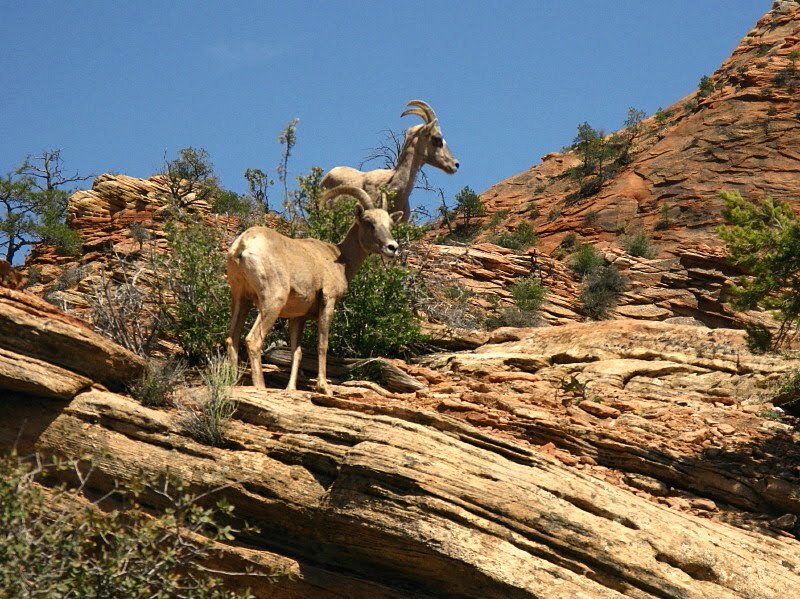 Stewart, Michael, 2006, Zion National Park: University of Illinois, Geology 104, Geology of National Parks and Monuments, Course Lecture Material (web only).